BeerViking: Moor Weird beer please! Are brewery taproom visits like buses – you wait for ages, then two come along at once? Maybe it's something to do with the great weather too, but either way, it's been a fruitful weekend, meeting family at Moor Beer in Bristol on Saturday, then cycling with the tribe to Weird Beard's open day in Hanwell on Sunday. 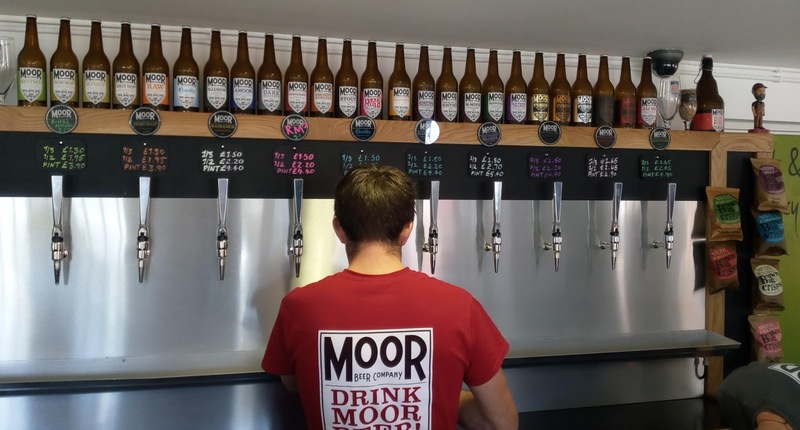 We first met Moor about 10 years ago, when it was run by a Somerset farmer and his daughter, who had just won 2004 Champion Winter Beer of Britain for one of her beers, called Old Freddy Walker. A few years later, she had moved on and her father sold the brewery, and then last year the new owner (and brewer) moved it from Somerset into Bristol, rightly realising that the Bristol beer scene had taken off in a big way and that it could be the ideal place for a brewery with a taproom. And what a nice little site he has created. Sure, it's in an unlovely and somewhat run-down area behind Temple Meads station, bounded by roads and the railway, but it's just about walkable from the city centre and inside is a bright bar with ten keg taps, while outside is a gravelled beer-garden (well OK, a beer-yard) with several picnic tables. If there's a tiny gripe (apart from the lack of cask ale!) it's that you can buy third-pints for indoor drinking, but only halves and pints to take outside. I guess it's because they use plastic cups for outdoors and they don't have these in thirds. It does make one a bit wary of enjoying the 6% or 7% beers though. Still, you can always buy bottles to take home instead – including Old Freddy Walker, by the look of it the only beer left from Moor's previous incarnation – or buy a two-litre growler and have that filled up. But whatever, we enjoyed several very nice ales. They ranged from the new 3.8% jasmine-infused Rider's Revival, brewed to celebrate the Tour de France, via Radiance, a 5% golden ale brewed with German malts for a Helles-like character, and Illusion, a piney 4.5% black IPA, through to Hoppiness, a chewy and fruity American IPA at 6.7%. The chilli-dogs and cheeseburgers from the July 4th-themed barbeque were jolly good too! 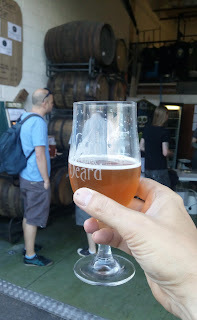 Then on Sunday was one of Weird Beard's periodic open days at its Hanwell brewery, on a small industrial estate near West Eaing. This isn't the easiest place to get to, certainly not by public transport, but it still seems to attract a good crew of locals who can walk or – like us – cycle there. In fact its closest transport medium is the Grand Union Canal which is right next to the industrial estate, and while a road route might be marginally shorter than the bendy canal – it's actually the canalised River Brent at this point – the waterside route is much nicer and can be a doggie walk too. After a slow drive back from Bristol in heavy traffic, then cycling along the waterside and nearly losing a dog on the way, we reached Weird Beard with less than an hour to go before its 7pm close. I'd missed one that I wanted to try, but there were still three beers on tap, plus of course bottles in the fridge. We both enjoyed the new incarnation of Little Things that Kill, just 3.8% but full flavoured, and hoppier than many session IPAs. I also had the Faceless Spreadsheet Ninja – I'm told this could be the last batch of this 5.5% Citra-hopped Pilsner, as they need their remaining stocks of Citra for other beers, but we can expect to see new versions with different hops. (Faceless Wordprocessor Ninja? Database Ninja?) Also still on tap was Something Something Darkside, their 9% black beer which I love – it's somewhere between an Imperial Stout and a Double Black IPA, and is rich and complex. The tribe enjoyed themselves too – the kids ambled about, with the boy discovering the one-armed bandit, and the dogs made new friends. It was really nice to see the WB crew again too. At last though it was time to head off, along with a few bottles for later consumption. Back along the canal and already looking forward to the next one. We'll try to be earlier next time!